Two WeChat users in Shouguang county of Shandong province were arrested on August 25, 2018 for spreading “rumors” about the spread of disease in livestock, triggered by record-level flooding in Shandong. Typhoon Rumbia , which hit the northeastern regions of China beginning on August 17, has left at least 13 people dead in Shouguang alone, and has done an estimated 9.2 billion yuan (USD $1.34 billion) worth of damage to the area, which is one of China's largest producers of vegetables and pork. The flooding has also killed an estimate of 250,000 pigs  in Shandong. A few minutes later, a member of the chat group shared their messages with another WeChat group, in a likely attempt to warn other people of the possible spread of disease. In less than 15 hours, both users were arrested  and detained for spreading “rumors” — in China, any piece of information  that does not come from official government channels can be considered a rumor. 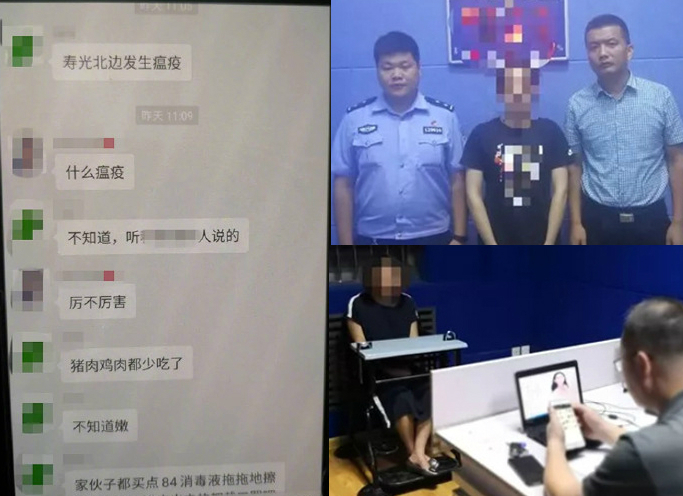 Shouguang police reported with photos on the arrest of two females for spreading rumors about a possible “plague” on a WeChat group on August 26, 2018. The arrest was reported by Shouguang police on their official Weibo account on August 26 at 3:37 am, and even included photos of the two women, as seen above. A number of media outlets followed with reports. Very soon the term “Shouguang” became a popular search on social media platform. China has recently strengthened  its approach to stopping the spread of “rumors” by using a centralized system that leverages artificial intelligence, social media data and user reporting. Now even private conversations about social unrest and natural disasters in chat groups can easily trigger the rumor switch and police can take instant action against the “talkative” ones, as seems to be the case in Shouguang. The users’ arrests have brought panic online. Social media outlet Today’s Headlines  posted a news thread about the arrests on August 26 that has attracted more than 1000 comments, most of which have slammed the local Shouguang authorities for abusing their power. This is such a joke. Both got the information from other sources. Do they have to go for a site visit and verify the information before they can warn friends and family members? People become very nervous facing disasters. They feel frightened easily. They shared what they heard about the plague with their friends and family, what have they done wrong? Shouguang has been flooded for days. In such weather, if I were in the region and someone told me that there was a plague, I would definitely believe this information and take precaution. Even the news reported that the authorities had arranged for drones to spray the flooded areas to prevent plague. It is wrong to spread rumors, but you can make clarifications. Now, you have neglected to inform people of the situation and arrested people for spreading rumors. This is a public performance to intimidate people. If they could react to the floods as effectively [as they do to the ‘rumors’], that would be great. The floods in Shouguang must be a rumor too! There is no plague, people’s skin just turned red and inflamed; the villages just smelled rotten and they were all blocked from entering. Please take it easy, information will be blocked and the real situation will not be reported on. So many livestock have died and the drinking water has been polluted. Once you drink the water, you are sick and this is not a plague? You have no idea. They arrest people and punish them lightly for their own good. If they don’t arrest them now, they would hook up with foreign enemies and use the negative news to subvert the state. Widespread online criticism has not stopped the Shouguang police from arresting more concerned citizens. On August 29, two more  users  were arrested for insulting Shouguang and Weifang police because they left angry comments under the two authorities’ Weibo posts about police efforts to save lives during floods. 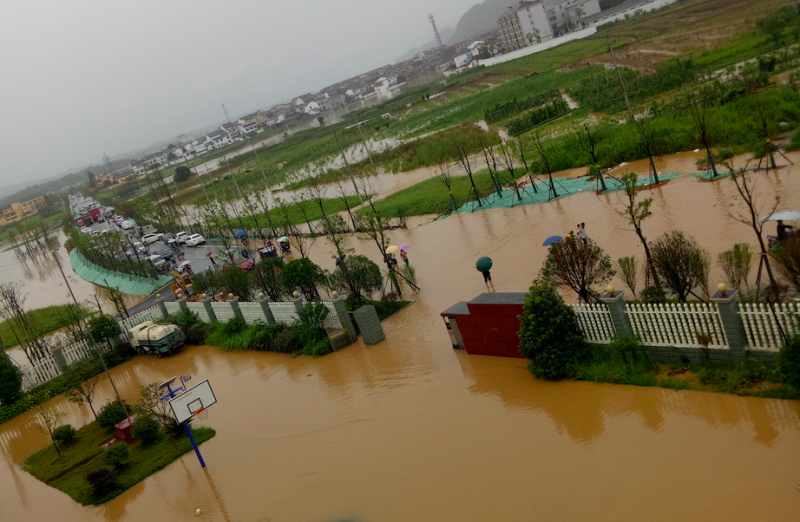 The floods hit Shouguang on August 19, and historical surveys suggest that they are the most severe floods seen in the region since 1974. Yet only four days later, official media outlets were already criticizing negative responses and censoring negative news about flood damage. Now, when one searches “Shouguang” on Weibo, most of the news items praise the authorities’ disaster relief efforts.